When I was growing up, parathas were a staple in my household. Parathas are unleavened Indian flat bread that are much thinner than naan and thicker than roti (also known as a rotli or chapati). My mom made them all the time. She’d make basic ones like I’ve made today; or she would throw in spices, vegetables or greens she had on hand to add flavor or make them healthier; or on occasion she’d even stuff them with a potato or cheese filling. They were all delicious! I love them so much that I will happily just eat a paratha plain with a little butter, yogurt or pickle. 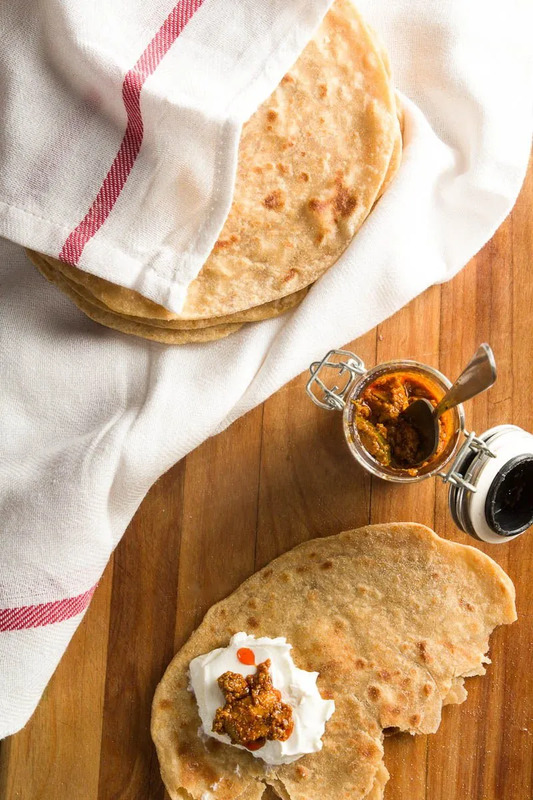 When I moved to Washington D.C. after college, I found myself regularly craving parathas. I’d often make them to share with my roommate and I’d make extras to take for lunch the next day. It made me really feel like a busy career woman. I didn’t even have chapati flour, which is a finely milled whole wheat flour that is used for roti and paratha. I’d make my parathas with a mix of grocery store whole wheat and all-purpose flours. I was cooking the food my mom had raised me with, I was improvising on ingredients, I had an apartment and a job. Wow! It all made me feel so incredibly grown up at 23. This week, Steve insisted we try to shoot a video. Although I was a little hesitant to be in front of the camera at first, I am really excited about our video. I knew that if we did a video, it should be for something that is a real basic in Indian cooking. I chose these simple everyday parathas because when you get the technique down, you can get really creative. Once you learn how to make these, you can add grated vegetables like zucchini or cabbage to the dough. You can add chopped greens like spinach or kale (check out this recipe for Kale Quinoa Paratha) to the dough. Or best of all, you can stuff them with a spicy mashed potato mixture to make aloo paratha. The variations really are endless. Hope you enjoy these parathas as much as I do and I hope you find our first full video helpful! In a large bowl, combine the chapati flour and salt. Mix well using either your fingers or a whisk. Create a small well in the middle of the flour and add 2 tbsp of oil or ghee. Mix in the oil with your fingers until you get a sandy texture. Add 1/2 tsp of oil or ghee and roll the ball of dough in the oil. Cover with a kitchen towel and let the dough rest for 15 minutes. Take one disc of dough, make sure to cover the rest so they don’t dry out, and press both sides into the rice flour. Then roll out the disc into about a 4 inch round. 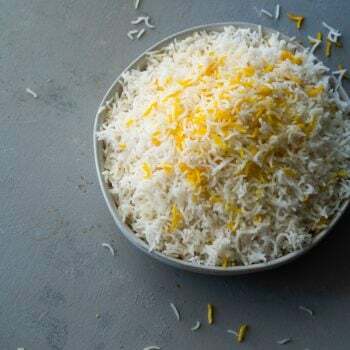 Spread a 1/4 tsp of oil or ghee onto the surface and sprinkle a pinch of rice flour on top. Fold the round into quarters and then mush back into a disc. Dip the disc back into the rice flour and roll out into a 6 inch round. Feel free to dip back into the rice flour if the paratha starts to stick to the surface as you’re rolling. Heat a 12 inch cast iron skillet or a tawa (a cast iron pan specifically made for making flat breads) over medium low heat. Transfer the rolled out paratha to the pan. Let cook until you see bubbles forming. 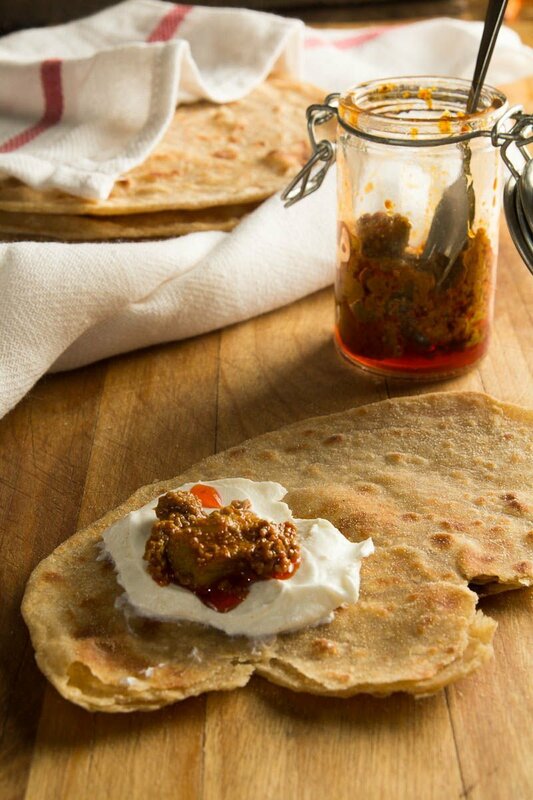 Flip the paratha over using a spatula. Drizzle 1/2 tsp of oil or ghee onto the side that was just cooked and spread it around with your spatula. Let cook for about 45 seconds to 1 minute. You will see more bubbles forming and you can check to make sure the paratha is ready to flip by lifting a side of the paratha and peeking under. If you see a few reddish brown spots beginning to form, it’s ready. 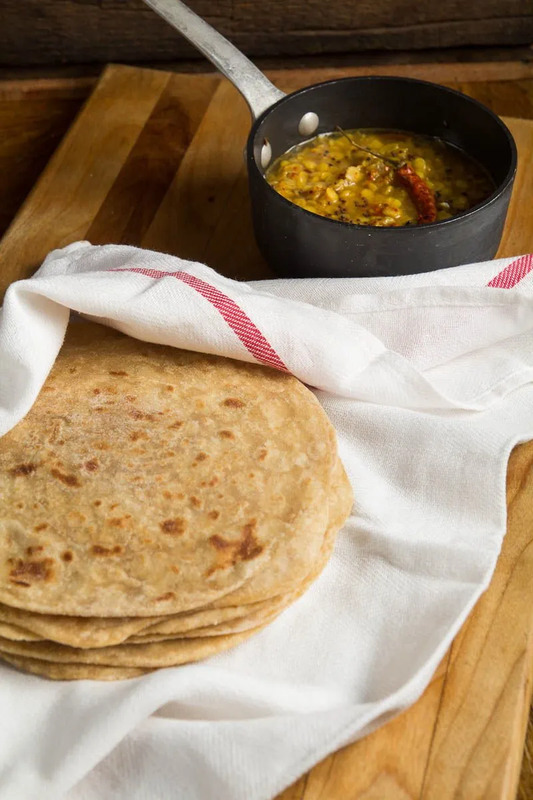 Substitutions: If you don’t have chapati flour, you can still make this without having to find a specialty Indian grocer. 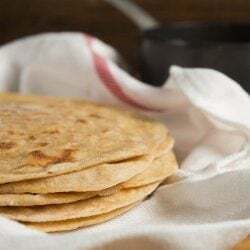 Substitute 1 cup whole wheat flour and 1 cup all purpose flour for the 2 cups of chapati flour. 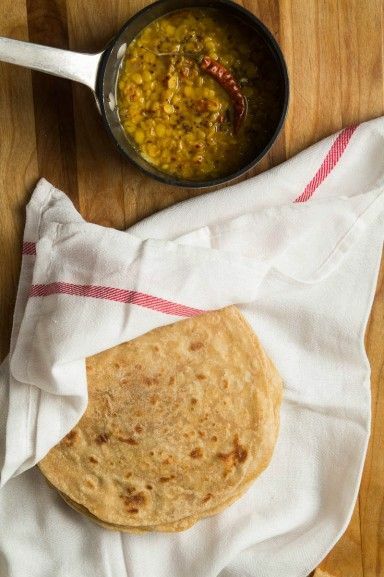 Comments on "How to make a Paratha: An Everyday Indian Flat Bread"
I love your 'How to' series. The other day I learned how to make your rice fluffy and not sticky...today paratha making tips. Awesome! 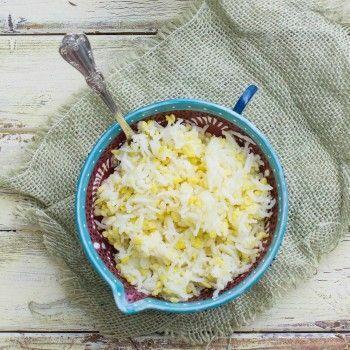 A basic yet mandatory recipe that comes to the rescue of every Indian household. I like the way you explain, and I really want to learn how to make the sauce or the yogurt, your guy's eat with chicken (bittyany) we'll somethings like that.???????? Puja - I love this video and the rice flour trick. I hope you continue to make more videos, these are great! Excellent recipe! Simple, fast and so good! I added some cumin seeds the second time I made it. Simple recipe, easy and quick. Just made a batch and they were delicious! Hi can I make these gluten free? Do you think chickpea flour would be a good substitute? thank you. Great recipe, and very easy to follow. Thank you for tonight's delicious dinner! Delicious! Just made these tonight...first time ever using ghee and chapati flour and they turned out great...definitely will make these again using your recipe/directions. Thanks so much! 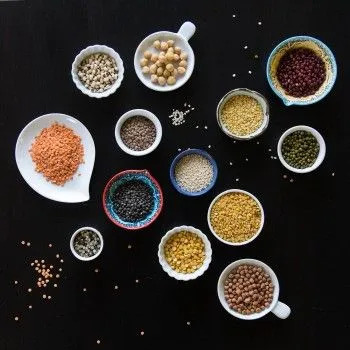 Since I can Not have wheat or rice can I make these with millet flour?